ST. JOHNS COUNTY, Fla. — A 52-year-old Jacksonville man has died following a single-vehicle crash in Ponte Vedra Beach Tuesday evening, authorities said. The Florida Highway Patrol identified the victim as David Thomas, 52, of Jacksonville. The accident happened just after 10 p.m. on State Road A1A at Guana River Road. According to the FHP, a Ford SUV was traveling south on A1A when it veered off the roadway to the right and crashed into palmetto bushes on the shoulder. The driver, troopers said, was transported to Baptist Medical Center Beaches where he died due to reasons under investigation. Stay with First Coast News for updates in this developing story. PONTE VEDRA BEACH, Fla. -- One family was displaced by a fire that ripped through their Ponte Vedra Beach apartment Wednesday night, authorities said. St. Johns County Fire Rescue rushed to the scene on Ponte Vedra Court about 9:30 p.m. where firefighters were able to contain a rapidly spreading fire to a single unit of a four-unit apartment building. While the two-story apartment sustained significant damage, the neighboring three units were not damaged in the fire, firefighters said. A county fire inspector is investigating the cause. The American Red Cross is helping two residents displaced by the fire. 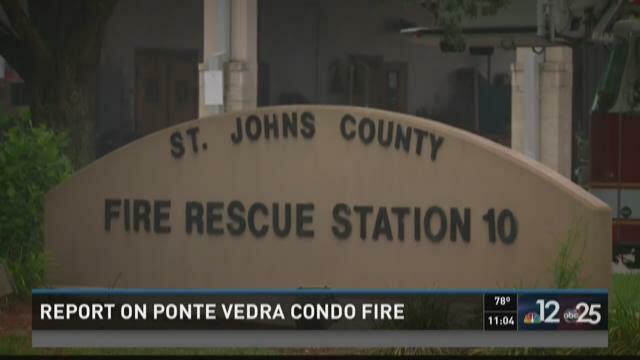 PONTE VEDRA BEACH, Fla. -- St. Johns County Fire Rescue has fired one of its emergency dispatchers and a firefighter has resigned in the wake of an internal investigation fueled by a fire that ripped through a Ponte Vedra condo complex. The July 13 fire, which destroyed at least 20 units and caused an estimated $2.5 million in damage, came under scrutiny following the release of a series of 911 calls, including one made more than an hour before crews responded. NOCATEE, Fla. -- At least six acres burned in a brush fire Monday. The Forest Service says the fire threatened homes at one point. "It's really scary," said Maureen Chen. She lives just feet from where firefighters with St. Johns County and the Forest Service were working. "It's really scary to think that we could wake up in the middle of the night and have a fire in the backyard of our house," she said. Neighbors say lightning started the fire, and within hours, flames were towering above homes. "20 to 25 feet over the roof line," said Chris Nelson. First responders were able to contain the fire before any homes were impacted. However, with no rain on the way and more storms in the forecast, Chen says she's hoping their home survives the fire season. "It is devastating, kind of heartbreaking to see," Chen said.